This is funny game for girls. Daisy is very handy girl. She bakes delicius cupcakes and she has her own shop. She must deliver the cupcakes to customers. Can you help her? Click with your mouse on customer and then the cupcake he wants. Enjoy! 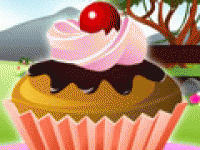 Choose related Daisy Cupcakes game online.